High quality pH test strips are essential for accurate test results. High quality pH test strips are essential for accurate test results. Since 1911 Macherey-Nagel has manufactured the highest quality pH indicators. These are the test strips we use here at the Essentials By Catalina Laboratory. It only makes sense to offer them to our clients. 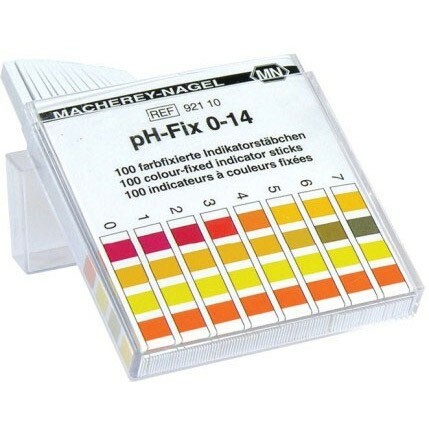 pH-Fix test strips allow fast pH testing directly at the point of interest. The easy dip & read procedure provides a reliable result within 10 seconds. For precise pH readings, the pH-Fix test strips use up to four different indicator dyes. The colour chart on the container exactly matches both the colour and position of the test pads on the strip. The patented pH-Fix technology ensures optimal usability of the test strips. During production, the indicator is chemically bound to the test strip avoiding bleeding even instrongly alkaline solutions. In weakly buffered solutions, the paper can be left in the solution for an indefinite period of time to obtain a final reaction colour without contaminating the sample. The long plastic handle effectively protects the user from contact with the sample.